Recolor your Easter baskets with Krylon® this spring! Easter Basket Decor was designed by Lynn Lilly. Clean the baskets with a tack cloth to remove any dirt and dust on the surface. Tape off the top section of the basket with painter's tape. Cover the exposed top portion of the baskets with plastic garbage bag and secure the bag and the first layer of painter's tape with another piece of painter’s tape. This will prevent overspray on the top portion of the baskets. Before spray painting, read and follow safety and application instructions on the label. On a covered surface in a well-ventilated area, spray the exposed bottom area of the baskets with either the Krylon® ColorMaster™ Paint + Primer in Gum Drop or the Krylon® ColorMaster™ Paint + Primer in Bright Idea. Two coats were applied to achieve the pictured look. Remove painter's tape while the paint is dry to touch. Set the baskets aside to fully dry. While the baskets are drying, spray paint the plaques and wooden accessories with varying colors, including Krylon® ColorMaster™ Paint + Primer in Metallic Rose Gold. One coat was applied to the accessories to achieve the look pictured above. Once the plaques are fully dry, drill two holes on the top of the plaques. 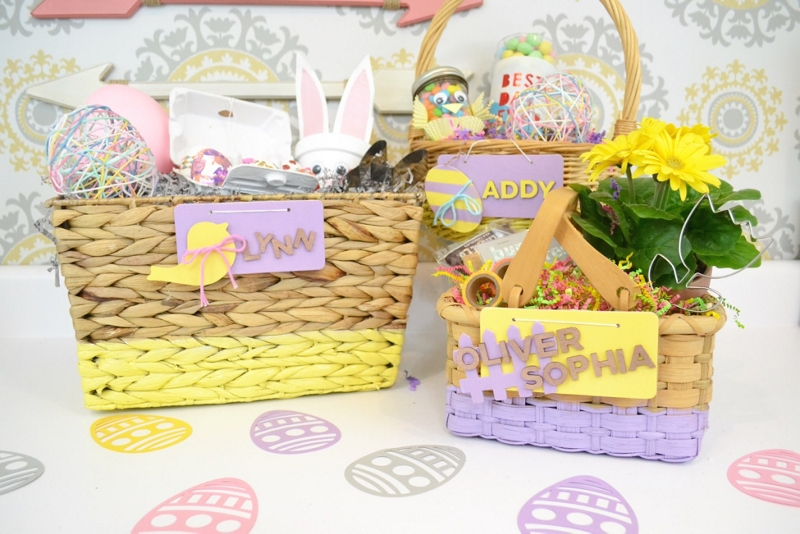 Use a hot glue gun to apply the accessories to the plaques to create personalized tags for each basket. Use yarn to hang the plaques on each basket. Fill baskets with your favorite Easter treats and enjoy!